We know that people come in a variety of heights and abilities, and they generally get taller from their youth to adulthood. In addition to how tall someone is, however, their ability to reach items in front of them or over their head is a function of the length of their arm, their range of motion (principally in the shoulder and elbow joints), and whether they are standing or seated. These are issues we need to consider seriously in creating aging in place solutions for our clients. What one person can reach, or what a typical reach extension might be, doesn’t work for everyone. Again, we all have various physical abilities. Where something is located in the home and how easy it is to retrieve it is part of the overall concept of storage. We design closets, cabinets, pantries, cubbies, nooks, niches, and shelving – and people purchase dressers, armoires, and other pieces of furniture that they use for various types of storage and retrieval. Still, if the client – the occupant of a given home – cannot access the items stored away so well for them because they cannot reach where they are located, the storage is ineffective except as possibly a longer-term way of retaining items put away and out-of-sight. Reach is given too little consideration in favor of the general design of cabinetry, shelves, appliances, furniture, and other storage devices in the home. Regardless of whether something is open (as in shelving or a bin), enclosed (like a cabinet or drawer), or a combination of these, it’s still the ability of someone to reach what is stored on or in the area in question. Aesthetics is part of the equation – we want shelving, cabinets, furniture, and other items in the home to look attractive and fit into the overall scape that is being created. However, form or appearance without a functional application or consideration as to how and whether something can be used well does not serve the clients like we are charged with doing. It doesn’t matter whether it’s a designer, an architect, a real estate agent, the homeowner or a member of their family, or anyone else who creates the appointments for a space, ultimately, we – as aging in place specialists – are ultimately responsible for making sure that our clients can function well within their living space. There are many aging issues that also affect a person’s ability to reach in addition to their physical size, the length of their arms, and whether they are standing or seated at the time they are trying to reach shelves, cabinets, or appliances and retrieve items from them. Arthritis, vision, coordination, and balance are some of the aging concerns that trouble older adults and limit their ability to control items they want to reach. The reaching process is not just a matter of touching the shelf, drawer, or item in question. A person needs to be able to grab or grasp the item they want, hold onto without losing control of it or dropping it (causing it to break or land on the foot), move it to where it is needed (countertop, table, or other surface), and continue without other activities. Therefore, the height of shelving, the style (or amount and type) of them, and many other design factors – particularly for upper shelving and cabinetry in kitchens, laundry areas, and bathrooms needs to be examined to make sure that the client and anyone else who might visit them or live with them can have full access to these areas. 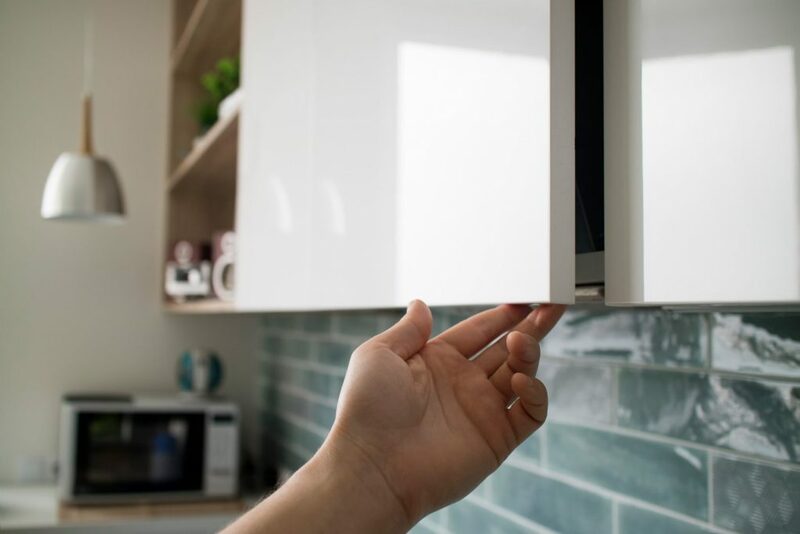 We may need to rethink our traditional upper cabinet locations of 18” above the countertop (54” AFF) or just use shelves – provided they can be accessed without being so low that they look inappropriate or are still unsafe to use. Arthritis can produce stiffness in the back that makes it difficult to squat, bend from the waist, sit, stand, or lift objects. In the fingers, arthritis can affect grip and finger extension. In shoulders and elbows, it can limit the ability to extend and rotate these joints. Weaker vision or cataracts can cause a person to experience depth perception issues which, in turn, affects how well they locate, reach, and retrieve items. Base cabinets have many shelves that pivot or rotate out to bring hidden contents to the user. Upper cabinets, unless they have inserts in them that cascade down to the countertop, don’t offer these options. Even at that, these inserts may be difficult for some people to reach or control. Shelves in place of upper cabinets may be a good solution for some people, but storing items on them so that they don’t become cluttered or a potentially falling hazard is another challenge. Storage, especially in the kitchen, deserves more attention than we have been giving it so that more people can use the cabinets, shelves, drawers, or appliances that we include.